Courtesy Serge Ibaka Via InstagramFollowing her split with NBA baller Serge Ibaka, Keri Hilson seemed to be making progress on her third album, the follow-up to 2010’s No Boys Allowed. Just as fans began to anticipate sad love songs on her next project, the singer has seemingly reconciled with her beau. 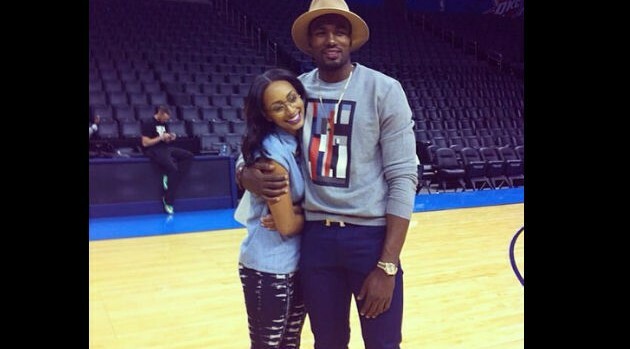 Following his Oklahoma City Thunder game on Wednesday night, Ibaka confirmed their relationship status on Instagram by posting a picture of the two hugging on the basketball court. “Had to get my girl back!” he wrote in the accompanying caption. In other Keri news, the singer recently logged studio time with producer Jim Jonsin, marking their first collaboration. Her upcoming disc also will include contributions from Rico Love, who co-wrote “Energy” lifted from Keri’s debut album, In a Perfect World.